We are proud to announce that for the 4th Annual Gamers Give Back, PIGDA will be hosting a Silent Charity Auction. This silent auction will be held in CMU’s Purnell Center lobby on December 11th from 11am-6pm, in conjunction with the ETC’s Building Virtual Worlds show. Stay tuned for a preview of the items that will be available. All proceeds will benefit Genre’s Kids With Cancer Fund. Now through December 4th, we will be accepting items for the auction. We are looking to the Pittsburgh game community to help us get some great items lined up. If you have an idea, an item, or connections to get an item, please contact jia@edeify.com. If you can spare a few more moments, please pass this message along to anyone else that might be interested or be able to contribute. Gamers Give Back? Silent Auction? Building Virtual Worlds? Genre’s Kids With Cancer Fund? I need more information! 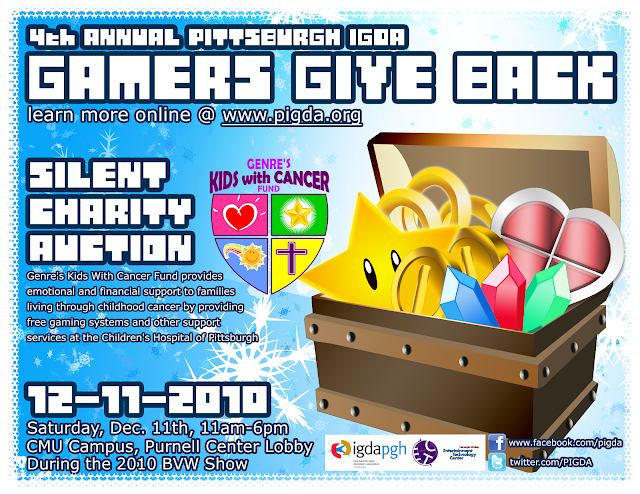 Gamers Give Back is Pittsburgh IGDA’s annual charity event. This event raises money to provide video games to children’s causes in the Pittsburgh area. PIGDA believes games are good for kids- especially when they are going through difficult times. This year’s Gamers Give Back event is a Silent Auction. This type of auction involves submitting bids by writing them down on paper rather than bidding out loud. At the end of the bidding period, the highest bidder on the bid list wins the item. The Building Virtual Worlds Show is an annual end of semester show for the Building Virtual Worlds class at Carnegie Mellon’s Entertainment Technology Center. Every year this show draws crowds of hundreds of people as well as VIPs from the video game and entertainment industries all over the US. BVW showcases student work and is always entertaining and memorable. Those familiar with BVW’s history in the community know that it has a special connection to the issue of cancer through its founder, Randy Pausch. Genre’s Kids With Cancer Fund provides emotional and financial support to families living through childhood cancer by providing free gaming systems and other support services at the Children’s Hospital of Pittsburgh. This new nonprofit was founded last year by Genre, an eight-year-old that was diagnosed with acute lymphoblastic leukemia, resulting in long hospital stays that were made tolerable thanks to games. In addition to the Silent Auction, you can support Genre’s Kids With Cancer Fund directly through a tax-deductible monetary donation through Paypal. If you’d like to make an in-donation of any items, please fill out this form. Finally, if you have five more minutes and want to hear more about why you should donate, please watch this video from the Children’s Hospital of Pittsburgh about Genre’s Kids With Cancer Fund. First things first, this is not a guide about how to handle corpses. This is a guide about how to run a Health Games Challenge site based upon the lessons learned by the Pittsburgh IGDA chapter. It’s called a post-mortem because that’s what we call detailed case studies in our industry. I don’t know why. Maybe it’s because we chronically over-work ourselves on passion projects that we end up getting so sick of after years of agonizing crunch that we like to imagine ourselves clinically picking through its dissected corpse at the end. Or maybe we’re just really goth (game developers do like to wear black and work at night). I dunno, ask Darius. Anyway, though I’m writing this late at night and tend to veer into stream-of-consciousness digressions when I don’t have an editor, I’ll try to provide some structure for this post-mortem by providing some background on the goals we had going into the Healthy Game Jam Marathon, how we structured the planning and organization of the jam, and what lessons we learned to run better jams in the future. One of my favorite truisms is that old saying about development (also applies to theatre costume design), “You can have it good, quick and cheap, but you only get to pick two.” Thanks to circumstances outside of our control, all of the sites for the Health Games Challenge had to be quick by default since we were only given three weeks prior notice to organize an event similar to the Global Game Jam but for the Apps for Healthy Kids competition. So now we just had to pick whether we were going to do it good or do it cheap. Thankfully, this decision was also easy to make since the IGDA had kindly lined up funds from the Robert Wood Johnson Foundation Pioneer Portfolio for all the sites. Honestly, if we hadn’t gotten the $1500 grant to run our event, we probably wouldn’t have done it. It was too short notice, but the funds made the event feasible. Also, I’m surprised I need to state this since it seems like common sense, but after speaking with some other organizers, it looks like most of the sites did not do this. Whenever someone offers you sponsorship, request the full amount as early as possible. This is generally true of fundraising and getting sponsorship for your events. Get the cash upfront as soon as possible so organizers won’t have to pay out of pocket. You’re already asking your board to volunteer their valuable spare time, so it’s nice if you can pay them promptly for their receipts (I usually pay immediate cash as soon as I get a receipt). Also, it’s highly likely you’ll run over-budget (we did), so it’s better to request the full amount and return any extra funds rather than under-estimate. 1. Official request from IGDA Chapter Admin Mailing List <chapter_admin@igda.org> forwards to our local chapter admin list, group comments on feasibility and asks for volunteers from the board to lead the event. 2. I volunteer to be primary lead on the event given my personal interest and qualifications (ran Dancetown, one of the early leaders in the Games for Health industry, have spoken at related conferences and know the sponsoring organizations, also been involved with prior game jams). Given the scope of the event, I ask for at least two other volunteers to help out with the event. 3. Manoj Anand volunteers to be lead on the physical location and secures Carnegie Mellon University’s Entertainment Technology Center as our space for the event. 4. Awkward silence on the mailing list as no one else volunteers. 5. Adam Nelson of Obscure Games Pittsburgh is suggested as a lead for a proposed physical game design component since we were planning on doing a physical games event with his organization sometime in the future anyway. He is very accommodating since we offer to provide him with space, funds, and professional game designers. 3. Adam is responsible for the food, equipment, and other costs for the last 6 hours of the event (physical games portion). This is incredibly worthwhile, and not just because it has the best food I’ve ever eaten at a conference. At the conference I learn about the current relevant topics in healthy eating, observe how the event is generally organized, and see how they lined up sponsors. I decide to focus exclusively on local organic groceries as sponsors and add more relevant speakers/guests interspersed throughout the event, including a closing artist I met during the event that’s from Pittsburgh. Though we tried to begin the sponsorship process early by creating a preliminary press release about the event to send out, we didn’t really get any sponsors until the week before the event when I basically started cold-calling local organic groceries. Given more prior notice, we could have potentially gotten larger companies such as Giant Eagle or Vitamin Water, but sponsors like those all require weeks or months lead up time to the event. Ultimately, I called up four local organic grocery stores on short notice and three of them were able to provide some sort of sponsorship: Whole Foods, Trader Joe’s, and the East End Food Co-op. While the donations did help cover some of our food costs, I pushed hard on sponsorships mainly because it adds legitimacy to our event and helps tie us to our local community. For example, check out this video interview we did with the store manager of the East End Food Co-op about their store and why they’re sponsoring our event. We offered this option to all our sponsors and I’m glad they decided to take us up on it so we could let people know about a great local organic grocery. Also, like this section title says, one trick to get sponsors on short-notice is to namedrop famous organizations and people who are already sponsoring you, such as Michelle Obama’s Let’s Move initiative. Also, always have some initial sponsors to seed the pot. I often make my own company, Couchange.org, sponsor many of the charitable events I’m personally involved in. Most likely, many of the people on your board also have influential positions at local companies. Don’t be afraid to ask them to encourage their companies to sponsor your events, it’s good for both your chapter and your local industry. Okay, so if you’ve followed our instructions for running a game jam so far, you’ve assembled a competent organizing team, delegated tasks, gotten sponsors, and are good to go, right? Well, no matter how well you plan, things will go wrong. Most likely in a Murphy’s Law fashion that you totally didn’t expect. So it’s best to be flexible and just go with the flow if something unexpected happens. For example, we had lots of last minute reshuffling with the schedule. Originally, we were expecting a speaker from the White House, Mr. McFeely, and massage therapists during our event. Ultimately all of that fell through, but none of the participants noticed since we only advertised speakers once they had fully committed. Instead, they were impressed by our vintage large-scale trophies from the Braddock Library (America’s oldest public library), inspiring keynote speech by Audrey Russo, and powerful closing poem by Vanessa German. 1. Under-promoted the event = We only had about 20 some partcipants during the event, less than half the attendance we usually have at similar events we’ve run before. Part of this is due to the short notice, bad timing (right after graduation), and proximity to to a recent board game jam (jam fatigue? ), but we could have also promoted the event better. The most obvious culprit, we’re still getting used to our new Twitter and Facebook accounts, which we didn’t efficiently utilize for promotion. 2. Inefficient use of food budget = With the lack of an accurate headcount, we narrowly avoided ordering way too much food for everyone. Some quick reordering by Manoj made the first day relatively efficient, but we still had lots of extra food and drinks by the end of the event. It seems it is much more efficient to just place group orders the day of the event when you have an accurate headcount rather than try to anticipate the number of people beforehand with a bulk order that usually ends up being wrong. Perhaps it’s best to just have a base minimal amount of snacks and drinks, then supplement it with additional food orders as people arrive. People also appreciate being able to order a custom meal from a menu rather than being given less choice with buffet style catering. 3. Tshirt Rush Order Again = It’s said that “those who do not learn from history are doomed to repeat it.” Since this is now at least the third event when we’ve had to do a rush order (additional $100) for our tshirts, you would have thought we’ve learned our lesson by now. People love that we do custom tshirts for most of our bigger events, but we really need to submit these designs at least two weeks beforehand to avoid the rush fee. 4. Lack of Followup = We’re all busy people, which is why this blog post is approximately two weeks late. There’s several things we need to followup with after the event. A post-event press release thanking all the sponsors would be a good idea. Plus, we should encourage all the participants to continue developing their games for the Apps for Healthy Kids competition since the submission deadline is rapidly approaching on June 30th. So I’m hosting a charity party tomorrow night at the Firehouse Lounge & Embury from 7-10PM in support of Kim Reed’s Race for the Cure, I hope you’ll join us there. I’m not going to write about why you should support Kim’s Race for the Cure or even how this event came together since Kim has already written about those subjects much more eloquently than I could. Instead, I’m going to write about something I’ve never written about before and very seldom talk about, my family’s history of cancer. One of the many things that I admire about Kim is her candor about a difficult issue, the personal subject of cancer in the family. It’s one thing to talk about cancer in the abstract sense, as a cause, something we can fight against together. It’s quite another thing when it literally hits home and directly impacts those you love. It’s a dark, serious topic. One that is not only uncomfortable to talk about but also might make others uncomfortable. Which is why, even though I have a history of cancer on both sides of my family, I usually never talk about it. But after learning about the importance of creating awareness from Kim and the great nonprofits we’ve been working with on this event like the Komen Foundation, Gilda’s Club, BRICKS for Young Adults, and the Cancer Caring Center, I feel like I should speak out. On my father’s side, it’s relatively simple, if you can say such a thing about cancer. My paternal grandfather died from colon cancer, which is why my dad has been getting screened every five years and why I will too eventually. Since my grandfather died from colon cancer in his 70s and my dad’s tests come up fine, I probably won’t need to get screened until I’m around 50, even though I’m at slightly higher risk. We have a young colon cancer survivor who will be speaking about this subject tomorrow. 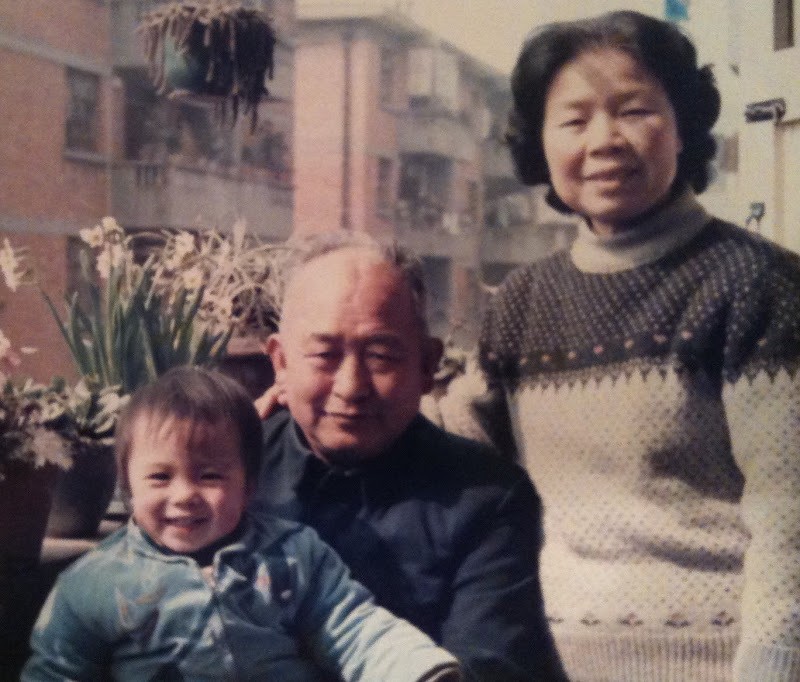 Thankfully, my Grandpa was a fighter (former military officer). He fought for his life and listened to the doctors. He did all the chemo, took all his medication regularly, and even participated in experimental trials, managing to survive for 10 years. In fact, we all believed he was in remission, which meant his sudden death in 1990 came as a devastating shock to my mother. Especially since she had immigrated to the US at this time and because of Green Card issues was not allowed to return home to attend the funeral (another reason why I don’t tell this story, since immigration is always a touchy subject in the US). One of my clearest memories from childhood is this image of my mother completely breaking down, sobbing hysterically while clutching the phone as she received news that her father died and she couldn’t return home to grieve and console her family. When we visit my grandfather’s grave or mourn his passing, she still sometimes apologizes about this, even though it was never her fault, which breaks my heart every time. It’s still difficult. My mother worries about her risk for cancer, especially since routine effective brain cancer screening tests have not been developed yet. And since my mother and I both work in technology (meaning constant, low-level exposure to radiation through various computing devices) and are genetically pre-disposed, we both worry sometimes. But would we ever stop using technology? Of course not, technology is wonderful and one of our main weapons in the fight against cancer. Without it, you wouldn’t know about our event tomorrow night (which I promise will be much more light-hearted than this blog post) and my company wouldn’t be able to be able to help out nonprofits by building new fundraising technologies. So in conclusion, it’s good to be aware of cancer, but don’t worry about it too much. Instead, come party with us tomorrow and Drink for the Cure! LOGIN Conference @ Seattle, WA = Started the conference circuit as a last-minute substitute on the Chinese Gaming panel, though all I really wanted to talk about was the potential of Asian-business-model freemium games for charity fundraising. This was pre-FarmVille, so there was still lots of skepticism about freemium games and no one had really done large-scale fundraising using social gaming yet. Still, we spoke about the topic to whoever would listen and started slowly nudging more developers towards ingame fundraising for charities. E3 @ Los Angeles, CA = While most people were focused on big announcements like “Beatles Rockband” or “Project Natal”, we started lining up support from various microtransaction platforms, digital currency providers, and other companies in the “virtual goods” space to partner on our initiatives going forward. A little bit of logistical difficulty here since I had committed to meetings at E3 prior to being accepted into GoodCompany Ventures, so I had to send other staff to Philadelphia in my place for the first week of the program. State of Play Conference @ New York City, NY = After becoming known for speaking about “Philanthropy and Virtual Worlds”, I somehow found myself on a panel about this subject at an academic public policy conference at the New York Law School. Despite being the only person on the panel without a PhD, I felt I managed to do a decent job representing the developer’s point of view. However, now that we’ve appointed a new Executive Director for Couchange who’s finishing her Economics PhD at MIT, I expect Pian Shu to be the one representing us at most future academic conferences. Penny Arcade Expo @ Seattle, WA = Enjoyed my time in Seattle so much, I decided to head back there to lead a panel on improving the world through games. It was very well-received, so much so that PAX will be incorporating a similar panel into all future events for both Seattle and Boston. My thanks again to Kristin Lindsay (Program Coordinator, Child’s Play), Jim Carol (Founder, Donategames.org), Jarrod Wolkowitz (GameSchool), and Craig Wacker (Program Officer, The MacArthur Foundation) for a great panel. GoodCompany Ventures VC Fair @ Philadelphia, PA = The conclusion to the inaugural GoodCompany Ventures program, also known in other Y-combinator-style incubators as demo or pitch day. It was actually the easiest pitch I’ve ever done since the GCV program is structured so that you basically pitch every single week on a specific topic (market analysis, sales, etc). Also really enjoyed working with the other companies, such as CalendarFly, who we’re continuing to work with to fundraise for schools across the country. GCV Green Spaces NY Panel @ New York City, NY = A joint event sponsored by GoodCompany Ventures and hosted by Green Spaces NY that we managed to sell out in a just a few days (see picture at top of this post). I attribute this mostly to the other high-profile speakers like Jacqueline Novogratz and Fred Wilson. While I also did an Ignite-style presentation about Couchange, I honestly felt like the lesser-know warm-up band opening for the main show. But then again, if I can manage to open for a three-time TED speaker, maybe that’s not such a bad thing. Which brings us to the present. So if you’re curious about what we actually do at Couchange and want to learn how you can raise real world funds for charities through those silly games people play on Facebook, come to the Beehive around 7PM this Thursday, March 25th. Or if you’re busy, just ask me about it next time you see me (or ask questions in the comments below). I’ll be in town a few weeks until I have to continue onwards to Philadelphia, Boston, etc for more speaking engagements. So this email news update for our local International Game Developers Association chapter might be syndicated on our blog. I’m just testing to see if we can basically cut and paste our email without having to reformat anything. Looks like yes. Also, I’ve gotten lazy yet again about updating my own blog, so consider this filler content. It does contain a brief mention about the conference I’m speaking at next week though. Congratulations to Shanna Tellerman and all the other hardworking people at Sim Ops Studios for being featured in a recent BusinessWeek special report about 3D internet technology. To learn more about Sim Ops’ 3D platform, visit http://www.wildpockets.com. You can take a look at the games that were recently created using Wild Pockets at the San Francisco Bay Area Game Jam and vote for your favorite in the People’s Choice Award competition. Last month, Evil Genius Designs, the ETC’s newest spin-off, successfully launched their mobile gaming platform at CMU’s annual Spring Carnival, winning a coveted Thistle. Currently working on winning the Penny Arcade Expo as a client, their technology would help keep lines of over 6000 people entertained for upwards of two hours at the annual conference in September. Later this summer, Skill-Life, who you might remember from Felix Lloyd’s lightning talk last year, will officially launch their CentsCity Beta. CentsCity is a virtual world developed to teach financial literacy and other valuable life skills. Local Friendship-based CivicsLab recently won the MacArthur Foundation’s Young Innovator’s Award in the Digital Learning and Media Competition for their “Your Place, USA” project, an online game based on demographic, fiscal and political conditions in southwestern Pennsylvania developed for kids ages 9 - 13. Your Place teaches sustainable practices by exposing young people to civic decision-making and regional planning. Created by Innovation Works, AlphaLab provides funding, hands-on business assistance, access to a network of entrepreneurs and expert advisors, and free office space as part of an intensive 20-week incubator program in Pittsburgh. A new initiative of The Sprout Fund, Spark supports small-scale projects and programs that engage children under the age of eight through the creative use of technology and media. Funded projects propose an innovative solution to a relevant issue or demonstrated need facing children in the city of Pittsburgh, Allegheny County, and the surrounding communities of Southwestern Pennsylvania. At the “Leaders of the Online Game Industry” conference from May 11-14, Jesse Schell will be keynoting with a talk urging people to “Make Games Not War.” Jia Ji will also be speaking on the China panel about his newest startup that provides technology for philanthropy in virtual worlds. If any other Pittsburgh companies are attending/speaking, please let us know. And if you or your friends in Seattle want to attend last minute, you can use the discount code “LOGINBEAT” to save $200 off the online registration price. If you prefer your conferences a little closer to home, the Game Education Summit next month will be hosted right at Carnegie Mellon’s Entertainment Technology Center. Also, if anyone is willing to host speakers during the conference, please let us know. Stay tuned for many more exciting things from your local IGDA chapter, including official PIGDA t-shirts and more fun summer events! If you have any ideas or feedback about events or anything else, please let us know. Also, if you have any pictures or video from PIGDA events, please remember to tag them “PIGDA” and share them with us. Thanks for reading our first Pittsburgh IGDA News Update, we hope you found it useful. Would you like receiving more updates like this about local industry events and companies in the future? Please let us know what you think by taking a quick survey. Since some of the people who still read this semi-abandoned blog (or at least still subscribe to its RSS feed) have sent me emails inquiring “Where the hell are you?” (direct quote from, master of subtlety, Woycheck). FYI, for those of you who are still curious, I’m currently in Chengdu, China, but I’ll be back in Pittsburgh in about a week so I can give a talk at CMU on April 4th. So if anyone wants to meet to catch up around then, send me an email. Vancouver, BC, Canada = My uncle and his daughter immigrated to Canada last summer, so I took a trip up north to visit them. My prior knowledge of the area consisted almost entirely of information based from Douglas Coupland novels, so I was expecting a Canadian version of Seattle. My expectations were largely met with the only surprise at how large the local Chinese population was (multiple “China Towns” spread throughout the city). Whistler, BC, Canada = Also vacationed a few days at the nearby resort town of Whistler, future host of the 2010 Winter Olympics. Of course, since I visited during the summer, I wasn’t able to experience any of the typical alpine related activities Whistler is known for, but I did get a chance to go horseback riding and ziplining. Trip was relatively uneventful except for the fact that a rockslide blocked the “Sea to Sky” highway (main route to Whistler from Vancouver) midway during the vacation. While the detour back to catch my flight tripled the driving time, it was a pretty scenic route. Venice, Italy = Spent Thanksgiving in Venice, the famous city of canals. Enjoyed the sights and food immensely, but the weather was terrible. Bitterly cold, wet, and generally miserable at night. The day I left the city, the flood of 2008 was starting, the worst in twenty years. Yet again, I narrowly avoid natural disaster by taking the waterbus out (most public transportation in Venice is aquatic naturally) to the train station just as the waters were starting to rise. Rome, Italy = The weather in the capital was much better, so I was able to spend a good amount of time touring the ancient ruins of the Colosseum, Pantheon, and other historical sites. Since I’m a bit frugal, I decided to visit the Vatican on the last Sunday of the month, when museum tickets are free. However, the lines were ridiculously long, so I wouldn’t recommend this if you want to see the famous sites like the Sistine Chapel. On the plus side, I did get to see the Pope (during his speech from his little apartment window) and attend Mass at St. Peter’s Basilica (first Catholic Mass I’ve ever attend, so if you ever invite me to one, know that I have high expectations). Pisa, Italy = The Leaning Tower of Pisa was quite a disappointment since it was much smaller than I expected. Instead of boring you with the details, I’ll instead talk about the pizza in Italy, which was amazing. Since I’ve eaten pizza most of my life, I was kinda expecting something similar to the American version, only with fresher ingredients. Instead, I was impressed by the variety of regional specialties. I’d really like a pizza chain in the US to adapt the “deli-style” service of the thick rectangular pizza they serve in some regions, where they seem to have an infinite variety of toppings. Florence, Italy = Honestly, my memory of Florence is a bit hazy since after a while all those statues and other works of art sort of blend together. I do remember I was visiting around the time of the 2008 US Presidential Election and listening to Barack Obama’s “Dreams from My Father” on my iPhone while walking the city. I highly recommend the book, especially the audiobook version read by Obama himself (perhaps his amazing oratory skills distracted me from the art?). Northrend, Azeroth = Okay, so this might not be a real world location, but I spent enough time playing the new World of Warcraft expansion, Wrath of the Lich King, I probably remember more about the flying city of Dalaran than Florence. I’m not sure what that says about me as a person, but I heard my friend Norm has finally been lured into Azeroth, so I’m not alone in this (and over 11 million other subscribers agree with us). Like I’ve said before, WoW is the modern-day equivalent of golf for the tech crowd, so let me know if you ever want to network while running an instance in Northrend. Shanghai, China = We might be in an ongoing global economic recession, but China’s economy is still chugging along, albeit at a slower pace. Most of what I know about Shanghai’s economy comes from my friends at Ubisoft’s local game development studio branch, which seems to be doing pretty well. They’ve basically taken over the Tom Clancy franchises (Splinter Cell and Endwar) and just gotten a new survival horror project. On a much sadder note, my condolences to the friends and family of Erick Wujcik, the former creative head of Ubisoft Shanghai that helped me out on previous visits to the city. Likewise for Randy Pausch, an amazing professor who founded the ETC, who’s now known world-wide for his famous last lecture at CMU (which you should watch immediately if you haven’t before). Okay, this post ended up being much longer than I originally planned, but I guess I’ve done a good deal of traveling in the last few months. So, contrary to what Kownacki says, I can’t teleport, but I do get around a lot. If anyone wants more detail about any of the cities I mentioned, feel free to leave a comment or shoot me an email. This sort of last-minute announcement is probably better suited for Twitter, but I still have 20 more days until my annual twitter post on the 30th. So hopefully this short blog post will be sufficient to get the masses all atwitter. At 7:30 PM, I’ll be giving a short talk at DevHouse Pittsburgh on “Developing Commercial Games Using Open Source Code”. Afterwards, I’ll be heading to the ShowClix launch party at Mr. Smalls Theatre. The first event is open to the public, but the second event has a cover charge. But what’s a measly few bucks to attend what some people are calling the party of the year (next to the Strom Heulsman podcast release party, of course). Tonight, I’ll be at ITPittsburgh’s first Connector event at the Altar Bar at 6 PM, talking about Dancetown. I’ve enjoyed speaking there before as panelist for Jessica Lee’s Entrepreneurial Thursdays. It’s a nice venue in a fun location, so please stop by (and RSVP if you can). Next week, I’ll be giving a slightly more technical talk at the monthly Dorkbot Pittsburgh gathering at the Brillobox at 7:30 PM. I should also be joined by my friend, Jim Jen, who’s going to be talking about Innovation Works’ exciting new AlphaLab program. That’s it for the next two weeks. If you’d like me to speak at a bar near you, just leave a message. I’m not booked for Saint Patrick’s Day yet, so you better act fast!